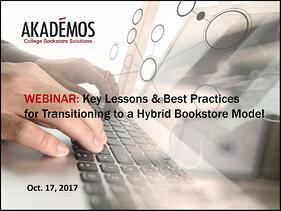 Yesterday's Key Lessons & Best Practices for Transitioning to a Hybrid Bookstore Model Webinar provided attendees with a road map and key insights on how to successfully transition course materials to an online bookstore and enhance the campus store. 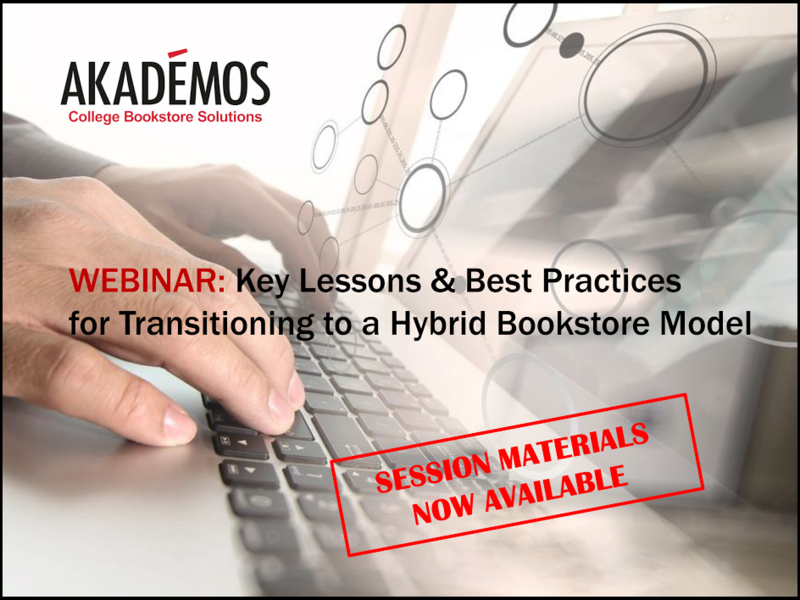 The Akademos virtual bookstore platform will drive textbook affordability by offering students a vast selection of low-cost options & enabling faculty to easily evaluate and adopt course materials. Akademos, Inc., a leading provider of online college bookstore solutions, announced today that Meredith College has joined its rapidly-growing list of partner institutions. 2017 President, Provost & Academic Leadership White Paper provides valuable insights and best practices for addressing the rapidly changing textbook and course materials marketplace. Today, Akademos, Inc. announced the release of its latest proprietary research survey and White Paper on textbooks, course materials and bookstore services. 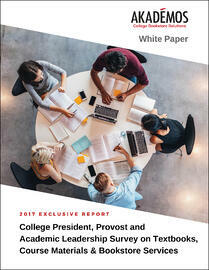 The findings of the 2017 President, Provost and Academic Leadership Survey on Textbooks, Course Materials & Bookstore Services provide unique insights into the obstacles colleges and universities face to reducing textbook and course material costs and highlights some of the best practices implemented across institutions to address them. 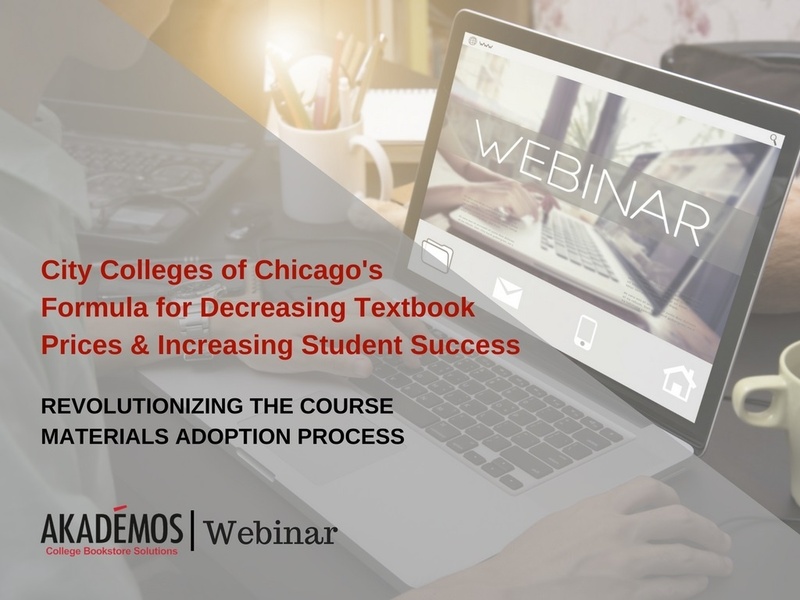 Last week’s well-attended webinar, City Colleges of Chicago’s Formula for Decreasing Textbook Prices and Increasing Student Success – Revolutionizing the Course Materials Adoption Process, received a lot of positive feedback from attendees. Participants found the live case study on how changes in the adoption process, new policies, and a new software platform played a large role in addressing textbook affordability and student preparedness, engaging and highly informative. The Akademos platform and marketplace will provide Houghton students with lower cost course materials and a highly personalized, user friendly purchasing experience. Houghton College, a Christian liberal arts college nationally recognized for its rigorous academics and stellar alumni placement rate, has selected Akademos as its online bookstore provider to help students save on textbooks and course materials. Houghton is located in the western area of the state of New York and is comprised of more than 1,000 students from 39 states, 31 countries, and 30 Christian denominations.